Essential oils are great natural ingredients to include in skin treatments to banish wrinkles and reduce the appearance of aging. 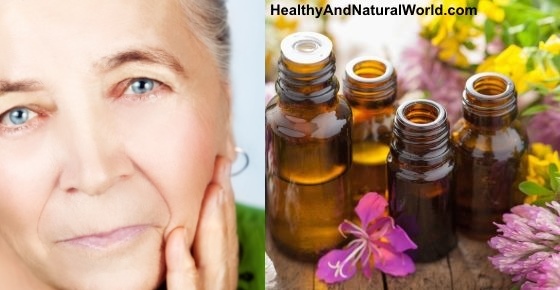 Using essential oils in homemade anti-wrinkle skin treatments help to firm your skin, keep it well-moisturized, and boost the skin’s production of collagen. Many essential oils also have antioxidant properties that help rid your skin of free radicals to reduce the visible signs of aging and sun damage. One of the benefits of using essential oils as part of your anti-aging skin care regime is that they are relatively cheap in comparison to many other commercial creams and easy to use. Most essential oils are too concentrated to be used directly on the skin. To make your own anti-wrinkle treatments, essential oils are diluted with carrier oils. Carrier oils like sweet almond oil, jojoba oil, grapeseed oil, and coconut oil help to keep the skin moist and supple to regenerate your skin. Many natural oils are also anti-inflammatory in nature and the fatty acid content helps to improve the skin’s elasticity. In this article, you will learn about the best anti-aging essential oils for skin care. You will also find great, easy to use recipes to combine essential oils with carrier oils to help treat aging skin and reduce the appearance of wrinkles naturally. First, let’s look at the reasons why essential oils can help to give your skin a firmer appearance. Why Does the Skin Wrinkle with Age? As we age, various factors combine which result in the visible signs of aging like wrinkles around the eyes and mouth, or saggy, wrinkly skin on your hands. Lemon essential oil is a great essential oil for preventing wrinkles around the eyes and mouth. Lemon oil contains large amounts of vitamin C which is a natural antioxidant that destroys free radicals from the skin, thus reducing the appearance of fine lines, wrinkles, and crepey skin. Lemon oil is also an effective oil to help reduce the appearance of scars naturally. Another essential oil that is excellent for mature skin is sandalwood essential oil. Extracts from sandalwood have great moisturizing properties and can help smooth skin that shows signs of aging. You can add clary sage oil to anti-aging skin treatments to help get rid of fine lines and wrinkles on your face and around the eyes. Clary sage is a popular essential oil to combine with other oils to heal skin wounds, prevent infections, and moisturize the skin. Frankincense essential oil helps to promote the growth of new cells, keep your skin elastic and firm and also helps reducing age spots. It’s not just aging skin that frankincense can help combat. It is a great ingredient to reduce the symptoms of eczema and other inflammatory skin conditions. Carrot seed oil contains beneficial compounds that can help smooth your skin and repair damage to the epidermis. Carrot oil is rich in flavonoids which have an antioxidant and anti-inflammatory effect on irritated skin. One excellent way you can rejuvenate your skin to reduce the appearance of aging and wrinkles is to add lavender oil to your skin cream. Lavender oil is well-known for its soothing properties and can help to soothe tired-looking skin. In fact, even inhaling lavender oil can help reduce wrinkles and the signs of aging by reducing psychological and emotional stress. This can have a positive effect in your battle against aging skin and wrinkles. Lack of sleep is also a factor in skin aging, and you can read my article on how lavender can help treat insomnia and sleep deprivation. Geranium essential oil is commonly used in skin care products for its antibacterial properties and pleasant aroma. Geranium oil can also help to smooth out wrinkles on your skin and give your skin a firmer look. To help prevent premature skin aging because of the sun’s rays, you can protect your skin by adding patchouli oil to your natural anti-wrinkle cream. Among the many beneficial skin benefits of patchouli oil are its antioxidant and anti-inflammatory properties. In addition, it also protects the skin from bacterial and viral infections. Myrrh oil has been used for centuries to help keep skin free of infection and promote healing. One of the benefits of using myrrh for skin aging treatments is its ability to reduce inflammation. Help rejuvenate your skin and help make it look more youthful by adding ylang-ylang to your homemade anti-wrinkle cream. Ylang ylang essential oil helps to smooth away wrinkles and fine lines on your face and around your mouth thanks to its antioxidant properties that protect skin cells. Rose essential oil is one of the best essential oils for dry skin and for boosting your skin’s elasticity. Rose oil helps keep your skin moist and is great to use as a moisturizer on your face or hands. Another reason for using rose oil in anti-aging skin solutions is that it has a pleasant fragrance and its aroma also has an antidepressant effect. Another essential oil that is anti-aging and helps to reduce wrinkles on your face and around the eyes is pomegranate seed oil. Pomegranate seed oil encourages new skin growth and helps to reduce wrinkles and other signs of skin aging. The benefits of pomegranate oil in reducing wrinkles are thanks to its antioxidant activities. The same report also said that pomegranate seed oil can help reduce high blood pressure, lower cholesterol levels, and protect against cardiovascular disease. Use rosemary oil together with other anti-wrinkle essential oils in your skin care regime. Rosemary essential oil is a great essential oil for wrinkles and can help to give your skin a firmer appearance. To get the full benefit to your skin from anti-aging essential oils, you should dilute them in carrier oils. Many carrier oils also have antioxidant activities that can help prevent the appearance of the signs of skin aging. Natural oils also provide deep skin moisturization to nourish and protect your skin from further damage. One of the most popular oils to use as a skin rejuvenator is grapeseed oil because it is relatively inexpensive. Grapeseed oil contains many fatty acids and vitamins that nourish your skin cells and regenerate your skin. The nourishing and antioxidant properties of apricot kernel oil make this a great natural oil for wrinkles. The anti-aging effect of apricot kernel oil is due to its high content of fatty acids and vitamin E.
You can use sweet almond to combat skin aging because it delivers essential nutrients to help nourish aging skin. Using sweet almond oil together with anti-aging essential oils helps the skin retain its moisture and tightens skin to reduce wrinkles. Some of the amazing uses of avocado oil include using it as a base for anti-wrinkle recipes. Avocado oil is used to treat many skin conditions like psoriasis and to improve the appearance of the skin. One way to reverse skin aging and have a healthier complexion is to use rosehip seed oil. Rosehip oil helps boost collagen in the skin due to its high vitamin C content. Rosehip oil also contains vitamin A which gives the skin a smoother look which tightens the skin and reduces the signs of aging. Evening primrose oil is high in antioxidants and is a good anti-aging oil to apply to your facial skin. Evening primrose oil is also good to treat inflammatory skin conditions like eczema and atopic dermatitis. One of the best anti-aging oils to moisturize your skin and give it a firmer appearance is jojoba oil. The main benefit to your skin that comes from jojoba oil is that it closely resembles sebum – the oily substance the skin produces to keep it moist. However, there is more to jojoba oil than just being a great moisturizer for mature, aging skin. The journal Pharmacology Research found that jojoba is rich in anti-inflammatory properties.26 This can help to improve overall skin condition and make your skin appear younger and healthier. Argan oil improves skin elasticity in older people and helps tighten up saggy skin. Argan oil is a skin revitalizer for aging skin by either taking it orally or applying it topically. The benefit of Argan oil for mature skin is that it helps to improve the structure of skin cells and gets rid of free radicals from the skin. Olive oil is great as a natural anti-aging skin treatment to reduce the appearance of wrinkles around eyes and on the face. When combined with other essential oils for wrinkles, the results on improving skin tone and reducing fine lines are impressive. Vitamin E oil is a well-known and well-studied oil for its antioxidant effects protecting the skin from damage. Applying vitamin E to the skin will also help to encourage new cell growth in older people, thus tightening skin and reducing wrinkles. A blend of virgin coconut oil and various essential oils can have an anti-aging effect on your skin and help to give a smoother look to your skin. Coconut oil has many practical uses when it comes to skin care because of its anti-inflammatory, antimicrobial, and moisturizing effects. Another great way to use coconut oil for your skin is to use it as a makeup remover. This way you can use the cleansing power of this natural oil and nourish your face and cleanse it at the same time. Skin test – Before applying the diluted oil to your face, first apply it to the back of your forearm to ensure that it does not cause any allergic reaction. This skin area is as sensitive as your face, but you can easily cover it to protect and hide it. It is very easy to make your own anti-wrinkle essential oil blend to help tone up sagging skin and get rid of fine lines. In general, you can use one or a mixture of any of the anti-wrinkle essential oils mentioned on this page. However, because essential oils are very potent, you should stick to the recommended amounts of essential oils in the anti-wrinkle recipe below. Mix 30 ml (1 oz.) of grapeseed, sweet almond oils, jojoba oil or any other carrier oil. Mix all the ingredients together and store in a small glass jar in a dark cool place. Apply a few drops to your face every evening after washing your face to help reduce fine lines and wrinkles in your face. Of course, you can mix and match the essential oils until you find the perfect recipe to help rejuvenate your skin. You can also use essential oils to get rid of wrinkles and refresh your face at the same time. For this anti-wrinkle anti-aging hydrating treatment, you will need a small spray bottle (the size that you can carry in your handbag). Fill a small spray bottle with 1 oz. water. Mix 12 drops of your favorite anti-aging essential oils. Before use, shake well to mix the oils and water together. Keeping your eyes closed, spray the refreshing mist on your face a few times to keep your skin hydrated. Do this regularly throughout the day to help combat the appearance of aging and wrinkles on your face. Below is one of my favorite anti-wrinkle blends which seems to have worked wonders for anyone I’ve shared it with. Directions – Dilute in two tablespoons of sweet almond oil and massage onto your face and neck every night. When you look at all of these ingredients you may think this recipe is very expensive, but it’s not. Once you have all the bottles of essential oil you can make it up in minutes and create a huge number of batches from your one bottle. You can get approximately 20-25 drops per 1ml of essential oil so from a regular 10ml bottle you get between 200-250 drops of oil – enough to make at least 20 batches of this anti-aging blend. Try it as an alternative to an expansive anti aging treatment. You can find all of these essential oils on Amazon. If you’d really like to give your essential oil collection a boost then try this Essential Oil Collection. It contains some of the oils you need for this recipe (apart from neroli oil, fennel, and frankincense) and a whole host more that you can use for yourself or gift to friends. Another great way to treat aging skin, keep it well-moisturized, and improve skin tone is by using the oil cleansing method. The oil cleansing method for mature skin uses specific oils to remove impurities from your skin and balance your skin. In my article on how to use oil cleansing for great-looking skin, you can find specific recipes for oily skin, normal skin, and dry skin. You can also add some of your favorite essential oils for wrinkles to help regenerate your skin naturally. Ethn Dis. 2010 Winter;20(1 Suppl 1):S1-78-82. Clin Interv Aging. 2015; 10: 339–349. DUJS. Why does your skin age? Dermatoendocrinol. 2012 Jul 1; 4(3): 308–319. Eur J Cancer Prev. 1997 Aug;6(4):399-401. Postepy Dermatol Alergol. 2015 Feb; 32(1): 21–26. Pharmacogn Rev. 2011 Jul-Dec; 5(10): 164–173. Inflamm Allergy Drug Targets. 2014 Jun; 13(3): 177–190. ScienceDirect. Essential oils used in aromatherapy. J Ethnopharmacol. 2014 Jun 11;154(2):408-18. Evid Based Complement Alternat Med. 2015; 2015: 896314. Iran J Basic Med Sci. 2011 Jul-Aug; 14(4): 295–307. Int J Tissue React. 2000;22(1):5-13. Ind J Nat Prod Res. 2012;3(3):366-370. Complement Ther Clin Pract. 2010 Feb;16(1):10-2. Evid Based Complement Alternat Med. 2013; 2013: 472382. Evid Based Complement Alternat Med. 2013; 2013: 827248. J Agric Food Chem. 2001 Sep;49(9):4502-7. Skin Pharmacol Appl Skin Physiol. 2002 Jan-Feb;15(1):20-5. Carcinogenesis. (2000) 21 (11): 2085-2090. J Invest Dermatol. 2006 Jul;126(7):1447-9. Which are the carrier + essential oils that can be used that don’t cause acne? Have a look at my article about essential oils for acne. You can see that some of them are also good for wrinkles. However, everyone is different, and example of it is virgin coconut oil. Some people say it’s comedogenic (meaning that it clogs your pores) and triggers breakout, while others say it works well for them. No matter what the product is, some will love it, while others will have a bad experience, and what works for you may not work for others. So in essences it’s often a matter of trial and error, and if something doesn’t work for you, try another combination. Can all of these essential oils and carrier oils be used under eyes, for sagging/hollow problems? Yes, they can, but since EOs are very concentrated, you must take special care to protect your eyes to prevent the oil from reaching your eyes. You need to be careful – Start from a very small quantity and don’t get too close to the eyes. Are there any oils that will help gum disease? Hi Alice, please refer to my article on How to Treat Gum Infection (Gingivitis) Naturally for more information. Good morning. What oil mixtures are good for puckered lip wrinkles.thank you. If the wrinkles are around the mouth area (usually above the upper lip), then you can use the blend suggested under the title “An Anti-Wrinkle Essential Oil Blend”. You can change the base oil if you want (I like especially rosehip oil, but it’s up to you and your own preference). You can also experiment with different EOs – they are all good choices. Apply a small amount above the upper lip to avoid the mixture getting into your mouth. If the lips themselves are wrinkly, avoid using EOs on the lips, and apply only natural oils, such as coconut oil, olive oil, sweet almond oil, or use natural butters (cocoa butter, shea Butter or mango Butter). Any solution for dark patches on the face ( pigmentation ) what to use ? Please refer to my article about uneven skin tone. Please refer to my article “Best Remedies to Shrink & Minimize Your Pores Naturally“. Thanks for all your wonderful information. I have been learning more about Essential Oils this past year and am a true believer in the medicinal benefits. I am dealing with Vitiligo and experimenting with Vetimer EO before going the path of expensive cream through my dermatologist. Since learning that this is an auto immune issue and no cure my diet is getting readjusted as well. Keep up the great forum!! This is very useful information and I love using various oils. What about tea tree essential oil. Is this oil beneficial for face and under eye wrinkles? Thank you. Hi Anna, tea tree oil is not traditionally used for wrinkles, however it is a great oil to add to a mix of other oils for the skin. It is especially good if you have oily skin complex or suffer from acne. It’s also has good antifungal and antibacterial properties so good for eczema, psoriasis, cuts or bacterial/fungal skin infections. but are any of these famous for powerful anti-wrinkle results? All of the above oils are good for that purpose and I don’t know if one of them is more potent than the others (I don’t know if there was a research that compared them all). If you have all of them, you can mix them to a blend. Otherwise if price is an issue, then lemon and rosemary are cheaper than geranium and frankincense (the last one is expensive). Also be aware to the fact that lemon essential oil is photo sensitive so don’t expose the skin to direct sunlight or UV rays – it may also affect your decision which oil to choose. Are there any anti-ageing benefits of castor oil? Castor oil has anti-inflammatory, antibacterial and anti-fungal properties which makes it an excellent skin treatment product. Castor oil is also excellent at cleansing the skin and you can find more details about it in my article on how to rejuvenate your skin using oil cleansing. It’s hard to recommend specific oil/s. I personally like to experiment with different ones, but I commonly use a blend of lavender, rosemary and lemon which are cheaper than other EOs but very versatile. I’ve used in the past frankincense (very expensive), geranium, sandalwood and others, but these are more expensive, so it’s really up to you. Thank you, Jenny, would you say the frankincense or the geranium had more effective results please? They are both very good for the skin, but because frankincense is very expensive, you can opt for geranium.